The current edition, released last week, is no exception. As you might be able to guess from the name, hidden europe is a travel magazine in the best sense, taking the reader to the corners of Europe that perhaps you have never heard of. In issue 47 this includes the Saxon villages of Transylvania and the mountain bothies of Scotland, but they also delve into the secrets of more familiar haunts, such as a Berlin suburb or a Vienna train station. What this means is that hidden europe is a journey of discovery each time it arrives in your letterbox, thanks to the editors and their small band of contributors. Displacement is the word of the moment. And the refugees who have moved in their thousands across Europe these past months compel us to reflect on the experience of the displaced. The most compelling images of migrants on the move have actually been devoid of movement: the remarkable patience of refugees trapped at Budapest Keleti station in late summer, and more recently the hapless situation of refugees stranded in driving rain on the border between Croatia and Slovenia. Exile and displacement feature in various ways in this new issue of hidden europe. We consider Geneva, a classic city of refuge. We examine a suburb of Berlin which has, over the years, received refugees in tens of thousands. And we explore villages in Transylvania to discover what happens to these places when everyone leaves. We also explore the question of links severed through past or present strife and conflict. What happened to all those trains which once ran between Zagreb and Sarajevo? And why has it now become impossible to take a train across the Perekopsky Isthmus to Crimea? And this is the key to hidden europe, and why they are proud to claim to be “more than just a travel magazine.” This is writing that informs, entertains but also leads you to ask questions. Questions about specific places or moments in time, but also about our own relationships with place and their stories. This is similar to what we are trying to do in the pages of Elsewhere, and it is no wonder then that not only has Paul written for hidden europe and will do again soon, but Nicky Gardner’s short essay on Mitrovica appeared in Elsewhere No.01. This exchange of ideas exists not only in the pages of our respective journals, but on a personal level as well, at a favourite table in Berlin’s Joseph-Roth-Diele. We are looking forward to more conversations on the 28th at Printed Matters, and many more future editions of hidden europe. 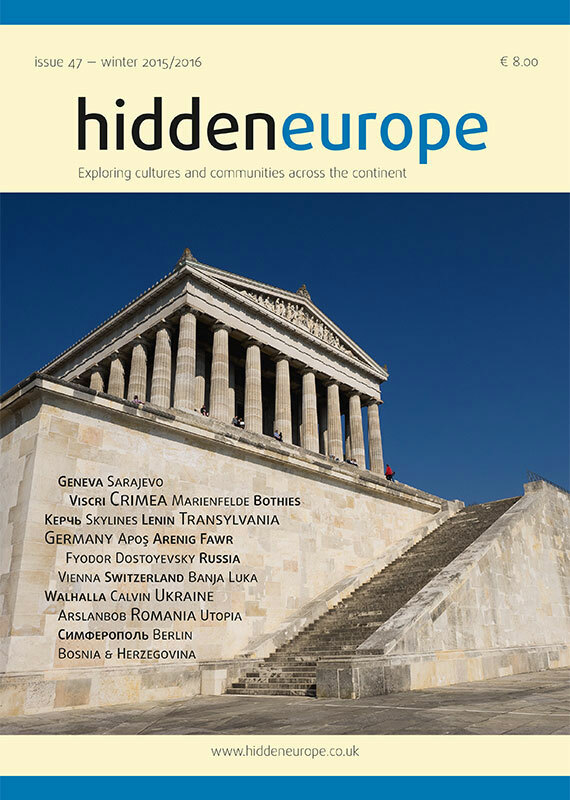 hidden europe 47 is available now through the online shop on the hidden europe website. Make sure you sign up on the website for their regular Letters from Europe email newsletter that, like the magazine itself, is always worth a read. If you are in Berlin, you can get a copy of Hidden Europe, Elsewhere, or one of the other wonderful indie publishing projects in the city at our Printed Matters event.